A great addition to any party! The filling from my favorite stuffed pepper recipe with a little extra cheese makes for a perfectly scoopable dip. I have a thing for chunky-style dips. If it’s smooth and creamy, I probably won’t partake in it… the only real exception being queso. Mmm, queso. Salsa? It’s gotta have beans and corn and chunks of tomato in it. Guacamole? That thing better be chock full of garlic and onion. Spinach and artichoke? All the artichokes, please. Today’s recipe for Stuffed Pepper Dip is basically a dream come true for me because there’s really nothing creamy about it – all the chunks, all the time. And it’s actually something I’ve been doing without thinking about it for at least the last 15 years. A couple years ago I shared a lightened-up version of my favorite stuffed pepper recipe, and I distinctly remember that because I wanted to get the proportions right for the sake of the recipe, I made exactly as much as I needed to stuff the peppers. No less, no more. And you know what? It made me sad. Because every time I make stuffed peppers, I purposely make too much of the filling. Way too much. Actually, I almost double the recipe. I stuff the peppers with as much filling as I can, and the rest goes in the fridge. Stuffed pepper filling is so easy to reheat, and it reheats so well. It tastes just as good as it did the first time, fresh out of the pan. And because of this, what I’ve always done is reheat it in portions and turn it into nachos. I would throw a layer of chips on a baking sheet, pile some stuffed pepper filling on top (and depending on how hungry I am, maybe another layer of each) and sprinkle it with some mozzarella cheese. I’d pop it in the oven for 10-15 minutes and voila! I would have a hearty plate of nachos. So yesterday it occurred to me – why couldn’t I just put the cheese in the filling, and dip chips in it instead? I was so excited about the idea, I rushed to the store after work to grab all the ingredients and got to work on it as soon as I woke up this morning. Yes – this all came together in a matter of 24 hours. Yes – I’m obsessed. It’s perfect. Just… perfect. And it’s incredibly easy to customize it to your tastes. Use ground beef instead of turkey. Add more cheese, or omit it altogether because it’s still so ridiculously good without it. Or triple the amount of corn if you’re like me and from the Midwest and have a completely healthy obsession with admiration for corn. 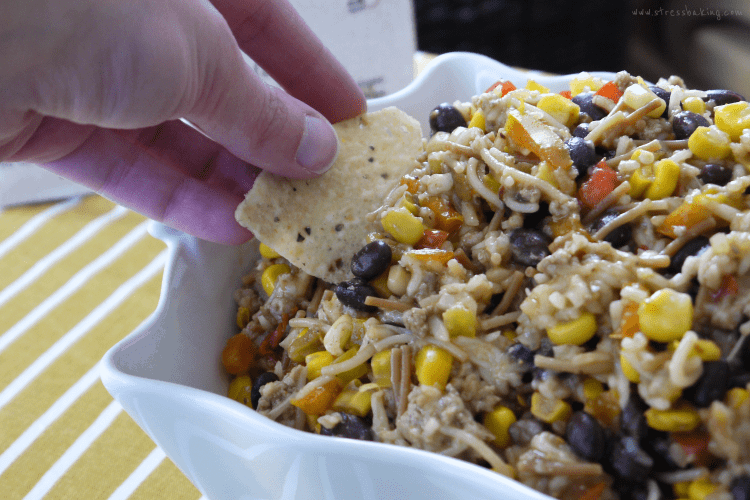 I can’t stress enough how perfect this would be for your Super Bowl party tomorrow. This isn’t some measly little snack that will leave your guests needing something with more substance. This filling is filling. But consider yourself warned – you need a study chip to support the weight of this thing. Cheapo store brand tortilla rounds are going to crumble under the weight of its awesomeness. So do yourself a favor and get the good stuff. Or just grab a giant serving spoon and dive in – I will in absolutely no way judge you. Your friends might, but who gives a crap about them. I’ll be over here applauding you – and frankly, that’s what matters. Prepare rice according to package directions in large saucepan, adding diced tomatoes to the mix. Set aside. In a large saucepan, heat olive oil over medium-high heat. Add onions and garlic and saute for 5 minutes. Add ground turkey and heat until no longer pink and slightly browned. Make sure the turkey is in the smallest pieces possible – you want to be able to scoop it! 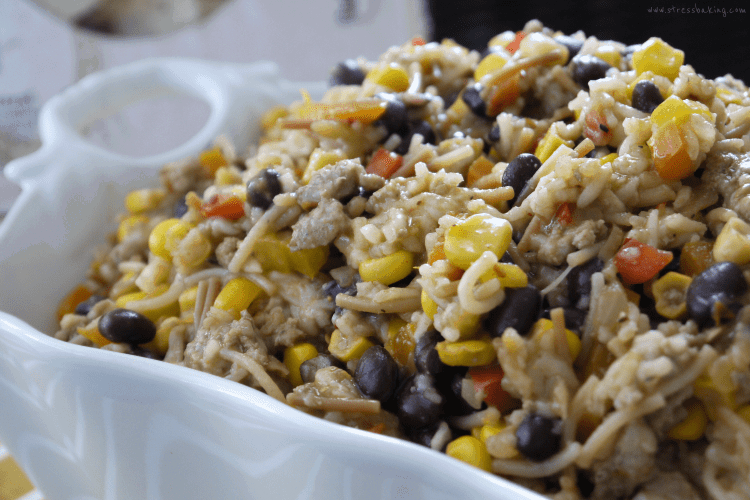 In a large bowl, combine ground turkey, prepared rice mix, diced peppers, black beans, corn, and green chiles. Stir to combine. Add cheese, crushed red pepper, cumin, salt and pepper and stir to combine. If your cheese isn’t melting as much as you’d like, just throw the mix back in a large saucepan and heat until the cheese is melted and thoroughly combined. This makes about 8 cups, but I don’t know how many servings that amounts to. Maybe for you that’s two servings. I’m not about to tell you how to live your life. To reheat, bake for 10 minutes at 350° F or pop it in the microwave for a few minutes.